KNOXVILLE - Sixteen elementary school students from Nature’s Way Montessori School in Knoxville will travel to Paris, France on October 4, 2018. There they will meet their French online video pals from Jean Zay Elementary School in Paris for a week-long French/American cultural exchange program. While in Paris, the Knoxville students will tour the city, visit the Pompidou Center Museum, and spend one night with their host families. 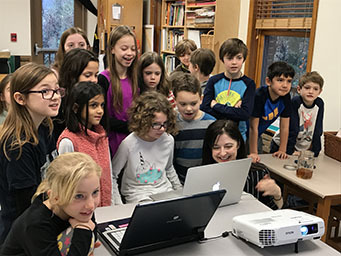 The program, called “Classes Duo Paris / Knoxville,” was initiated on January 12, 2018, when sixteen students from Jean Zay Elementary School in Paris, France and sixteen students from Nature’s Way Montessori School in Knoxville, Tennessee met online for their first livestream video exchange. The theme of the exchange, which was the first of seven monthly hour-long sessions, centered around the artistic vision of Knoxville-born, expatriate painter Beauford Delaney. Delaney lived for twenty-six years in the French capital and died there in 1979. The Pompidou Center Museum holds an important painting that he produced during his Paris years. The idea for a cultural exchange between French and American elementary school students evolved from a solo exhibition about Delaney’s life that the Wells International Foundation (WIF) organized at Columbia Global Centers | Paris in 2016. By the end of the six-week exhibition, interest in the Knoxville artist was intense on both sides of the Atlantic. To build on this interest, WIF Founder and CEO Monique Y. Wells began seeking information on how to establish a “sister city” relationship between Knoxville and Paris. Contacting the City of Paris, she learned about “Classes Duo” – a cultural exchange program created for young French children to arouse curiosity in foreign cultures, encourage interaction with children in foreign countries, and stimulate interest in learning a foreign language. “When I saw how well the goals of the city’s cultural exchange program aligned with several of the foundation’s Strategic Focus Areas, I realized that this would be a perfect match,” Wells declared. The City of Paris connected Wells to the local municipal office that oversees after-school activities in the neighborhood where Delaney lived during his stay in Paris. Jean Zay Elementary School, a public school in the 14th arrondissement (district), was selected for the exchange. Educators from both schools contributed themes for the monthly encounters, with events from Delaney’s life and examples of his figurative and abstract art providing a common thread. During the sessions, the students performed songs and dances, displayed their own artistic creations, and asked questions in their interlocuters’ language about the other’s culture. With excitement running high since the beginning of the program, the young American students are looking forward to meeting their video pals in person in October. A reciprocal visit of the French students to Knoxville is being discussed.